Beer lovers have a new reason to hang out in downtown Fort Lauderdale. 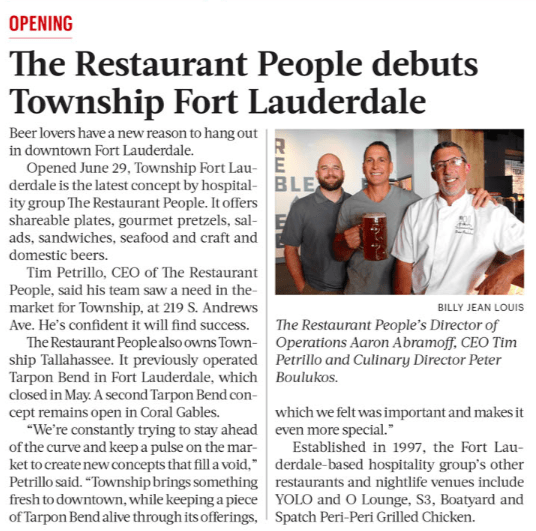 Opened June 29, Township Fort Lauderdale is the latest concept by hospitality group The Restaurant People. It offers sharable plates, gourmet pretzels, salads, sandwiches, seafood and craft and domestic beers. Tim Petrillo, CEO of The Restaurant People, said his team saw a need in the market for Township, at 219 S. Andrews Ave. He’s confident it will find success. The Restaurant People also owns Township Tallahassee. It previously operated Tarpon Bend in Fort Lauderdale, which closed in May. A second Tarpon Bend concept remains open in Coral Gables. Established in 1997, the Fort Lauderdale-based hospitality group’s other restaurants and nightlife venues include YOLO and O Lounge, S3, Boatyard and Spatch Peri-Peri Grilled Chicken.